So… where to start with this one? Rey is a door-to-door cutlery salesman. He roams from home to home in a small town in Vermont, attempting to sell cheap knives to backwoods locals and hoping it all culminates in a bedfest with his boss. That is until he stumbles upon a home that is covered in analog television sets, all which appear to feature Rey in various predicaments: Rey walking up the street, Rey laying dead in a pool of blood, Rey murdering the homeowner’s wife. Believing that the town is recording his every move, Rey attempts to find the source. What unfolds is more than he could’ve imagined and leads him down a very dark road, full of analog analog towers and eyeless creeps with powers beyond comprehension. Man, what a freaking weird novella but absolutely engaging. It is lude, crude, gory, and a mindf^*k of a book but I couldn’t seem to put it down. The first few pages give you only a glimpse of the thrill-ride you are in for and the seat belt buckle is broken. Rey is in the same boat as the reader, having absolutely no idea what is going on, why it is going on, or where he needs to turn to find a solution. I think that is what kept me so engaged: I had no idea where the heck this book was going and I couldn’t wait to get to the climax, much like Rey. But when I got there, it was a little abrupt and answered none of my questions; it only left more drifting into the ether. 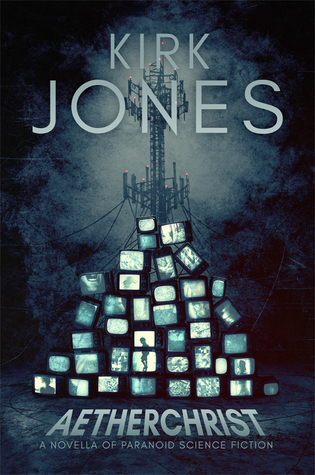 Jones may have hooked me as a reader with this one, even though this is just my first foray into his mind. The cover alone gave me, and my buddy Michael Patrick Hicks, the itch to purchase and we are both glad we did. Just don’t blame me when you look at a tower differently the next time you pass one on the interstate.